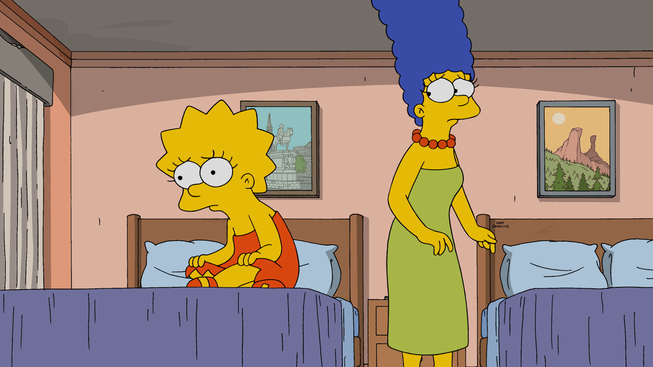 The new season of The Simpsons continues, and this Sunday, April 3rd, 2016, Fox aired “The Burns Cage”, the 17th episode of Season 27, and the 591st episode to date. This Episode Fact File will recap the episode with pictures, video clips and more. Get the scoop right after the jump! When Smithers is devastated by Burns‘ lack of affection towards him, Homer makes it his mission to find him a boyfriend. Meanwhile, after Bart orchestrates the removal of the lead in the school’s stage production of Casablanca, Milhouse serves as a terrible understudy, which frustrates his co-star, Lisa. 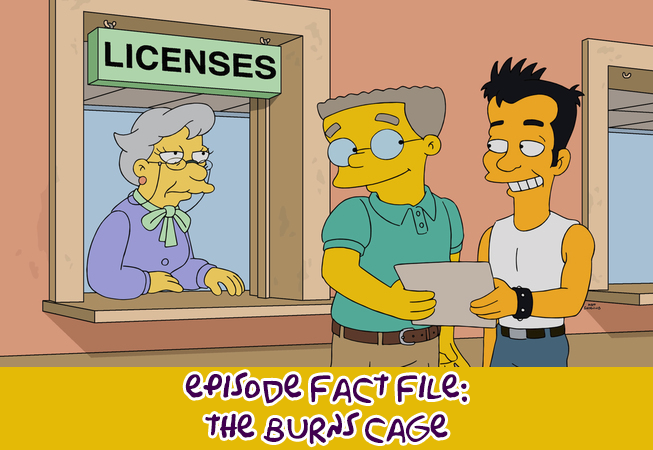 Episode Details: ‘The Burns Cage’ is the 17th episode of Season 27 as well as the 591st episode of The Simpsons. The episode aired on FOX on April 3rd, 2016 and was written by Rob LaZebnik and directed by Rob Oliver. Smithers and Mr. Burns go skydiving together, but Burns blacked out and slip through his parachute, so Smithers jumped after him, managing to catch Burns during freefall and save him. When they reach the ground, Smithers decides to proclaim his love to Mr. Burns, but he’s ignored. Broken-hearted, Smithers decides to supervise the work from the Plant’s employees: Homer, Carl and Lenny. They all realized what was going on, so Homer decided to find a new soulmate to Smithers so he would not be angry at work. Homer decided to invite all gay men from a dating app, Grinder, to a party where Smithers could pick his new love, but he got very annoyed and decided to just take a drink and leave. At this moment, he meet Julio, and they fall in love with each other. Smithers quits his job at the nuclear plant and decides to move to Julio’s homeland: Cuba. With Smithers out, Burns tried to find a new replacement for him, but everyone he tried failed miserably. But things weren’t going well in Cuba either, as Julio discovers that Smithers haven’t got over Mr. Burns yet. They break up and Smithers travels back to Springfield, where he and Burns reconcile at a romantic dinner. On a secondary plot, the Springfield Elementary School was making a Casablanca play. As Lisa manages to get the role of Ilsa, Milhouse auditions to the role of Rick so he and Lisa could be the play’s main couple. However, a new kid named Jack gets the main role. As only him and Milhouse auditioned for that character, Bart decides to take him out of the play by getting Dolph, Jimbo and Kearney to beat him, but their plan backfires as Jack defeated them. However, Principal Skinner sees Jack beating the bullies and takes him out of the play, giving the main role to Milhouse. Lisa is upset, fearing that Milhouse‘s lack of talent could ruin the play, but Marge convinced her to support Milhouse so he could do better. At the play, Milhouse gets his lines perfectly, surprising everyone. At the end of the play, however, it’s revealed that Jack was playing Milhouse portraying Rick, and he and Lisa go out for a float together. PRODUCTION! : In an interview, Al Jean said that in the episode, Smithers quits his job and falls in love with Julio. A Villanova Wildcats men’s basketball team member, with the number 18, jumps over the title screen and scores. Homer sends a message with emoji of him, Marge, Bart, Lisa, Maggie and the couch, and recieves in answer “Meh” “I don’t get it” “Needs a payoff” “Created by Matt Groening“, to which he says “Oh, sorry, yes sir”, and “Developed by James L. Brooks Matt Groening Sam Simon“, to which he says “Who are this guys?”, and the reciever sends “Meh” again. The title of the episode is a reference to the 1996 comedy film The Birdcage. L’Homme qui marche I (Alberto Giacometti). A Villanova Wildcats men’s basketball team member is seen in the title screen and Bart writes about them needing to win or they’d lose everything on the blackboard. The song This Guy’s in Love with You by Herb Alpert plays after Smithers and Mr. Burns land from the parachute jump. The song Celebration by Kool & The Gang plays when Smithers is dating Julio. The school is doing a play of Casablanca, and will do Equus or Top Gun the next day. Homer uses Grinder to find a lover for Smithers, a parody of Grindr, a homosexual geosocial app. Comic Book Guy wears a Hello Kitty costume. Tom Collins‘ name is a reference to the cocktail of the same name. Bart gets Comic Book Guy to buy a half-page advert in the playbook by telling him that Sam will play “As Time Goes By” with Hulk hands. Martin is later seen trying to play the piano with Hulk hands. The montage at the end showing Moe, Jack and Groundskeeper Willie on a journey for gold is a reference to The Treasure of the Sierra Madre. The image of Lisa and Jack on The African Queen boat is a reference to the film The African Queen. The image of Moe with a noose around his neck and standing on the shoulders of a boy is a reference to the pivotal scene, revealed in flashback, in Once Upon a Time in the West. Smithers refers to Homer, Lenny and Carl as Larry, Moe and Curly, and then the three start acting like them. George Takei mentions Klingons from Star Trek. The sign in Havana that says “Our Castro district is much different from yours” is alluding to the Castro District of San Francisco. 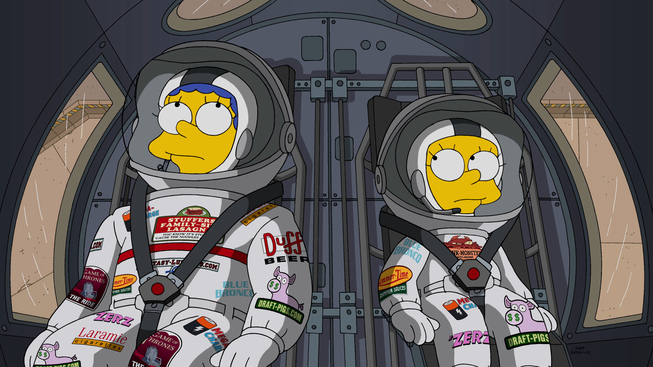 The Simpsons logo appears over the clouds when Smithers and Mr. Burns were parachuting. Rob LaZebnik told in an interview that the inspiration for this episode came from his relationship with his homosexual son, Johnny LaZebnik, who came out during high school. Vladimir Putin on a horseback was previously seen in Treehouse of Horror XXVI. The banner of the opera to be played the next day after Casablanca changes between scenes from Equus to Top Gun. At the Licenses Bureau, it’s possible to see for a fraction of a second that the lady gives Smithers and Julio a Marriage License, but later, it’s a fishing license. Janey Powell calls herself “Jacqueline Jones” in this episode. This pictures and videos are from the “The Burns Cage” episode of FOX show The Simpsons. Their use is believed to qualify as fair use under United States copyright law. Previous How Do the Crook and Ladder Items Affect the Conform-O-Meter?